Press section is an important part of paper and board processing and improves the paper quality and performance of the system greatly. The main target of press part is to increase dryness of sheet and also to enable web runnability at the beginning of the dryer section. The press section also benefits the sheet surface properties. Leizhan’s pressing system is an ideal solution to meet the requirements of paper plant for effective dewatering. 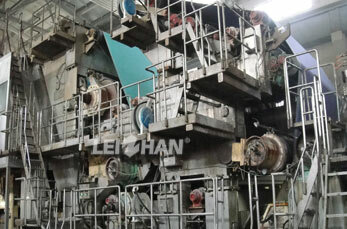 Leizhan press section for paper manufacturing consists of two jumbo rolls press, and press type is hydraulic loading. Devices required in the press section contains: Press Sectional Frame, Suction Pick-up Top Roll, Jumbo Press Roll, Felt Roll, Cleaning Roll, Concave, Cleaning Roll Doctor, Felt Suction Box, Shower Pipe(High pressure shower and low pressure shower), Auto Felt Guide, Felt Electrical Stretcher, Save-all Trays, Walkway and Ladder. The high operating performance of Leizhan press section provide high quality finished products, high water separation capability as well as good overall runnability. Leizhan press section meets the huge water separation capacity demands of high working speed paper equipments.